A waffles recipe, whether it be sweet or savory, is a favorite of nearly everyone. They’re perfect for a weekend brunch, breakfast for dinner, or even dessert. You’ll love this banana chocolate chip waffles recipe! I am pretty convinced that my boys could subsist on bread alone. That would be their preference. Carbs, with a side of carbs, and maybe a little sugar (eg. ; more carbs) for good measure. If I fed them nothing but bready food, with the occasional steak thrown in to shake it up a bit, I doubt I would hear a single complaint. 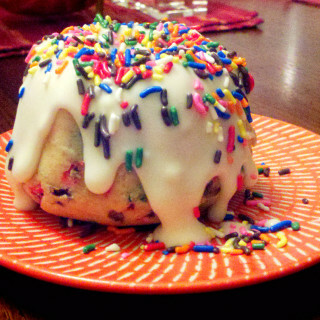 That makes breakfast-for-dinner nights a big treat in our house. We do it a few times each month, partly because it’s fun, but mostly because I am decidedly not a morning person, so we rarely venture beyond cereal or baked oatmeal with fresh fruit first thing in the morning. Hubby realized my lack of enthusiasm for mornings early on. We lived together less than a week when he said “Soooo, you pretty much just don’t talk in the morning.” Smart man. I love making breakfast, just don’t ask me to do it when I first wake up. But breakfast food for lunch or dinner? Now, that’s more my speed. When hubby will be away in the evening, it’s “Kid’s Choice Night” for dinner. As such, whenever I ask them what they want to eat, they almost invariably shout “Pancakes!” or “Waffles!” Sometimes I think they like them not so much for their bready goodness, but because they are a vehicle for syrup! Their absolute favorite is my banana chocolate chip waffles recipe. They are crisp on the outside, fluffy on the inside, and delicious all over. And they are easy to make! Bonus! Some of the recipes for waffles that I’ve seen are kind of fussy with their separate-the-eggs-from-the-yolks, and their beat-the-tar-out-of-the-egg-whites, followed by the fold-the-stiff-whites-into-the-batter. Puh-lease! That seems like an awful lot of work for waffles. This recipe is about as un-fussy a waffle recipe as you can get. And it works for both standard and Belgian waffles! Start by beating the eggs until they are well blended and fluffy. Then you literally dump in most of the remaining ingredients, except for the bananas and the mini chocolate chips. (That’s the sugar, baking powder, salt, flour, milk, vegetable oil and vanilla.) Stir it until the batter is combined. Really! Just dump it all in there. You don’t have to do all that separating, beating, and folding. You’ve got more important things to do with your time. Like sorting 72 loads of laundry, or getting melted crayon out of the dryer, or squeezing in a shower. Wait. That’s my life. 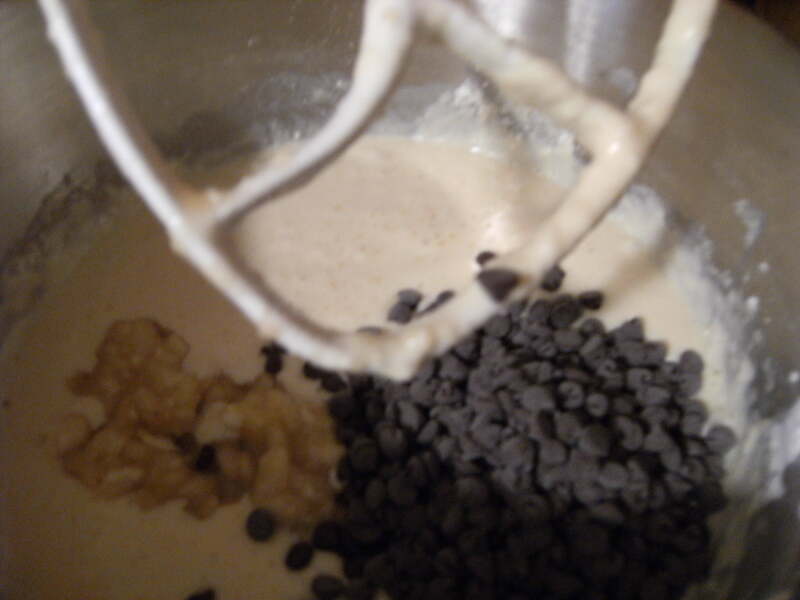 Stir in the mashed bananas and mini chocolate chips. Yeah, the good stuff. I know that bananas and chocolate may sound a bit odd in waffles, but it works. Boy, does it ever work! The bananas and chocolate take this waffles recipe to a new level of yumminess! That was from my eldest, who is clearly excited about waffles tonight. Cooking waffles quickly is what gives them that nice crunchy exterior, while keeping the inside soft and fluffy. So, preheating is a must. That said, give the preheated waffle iron a light spritz with cooking spray. Nothing is more upsetting than gorgeous, golden waffles that won’t come out of the waffle iron. 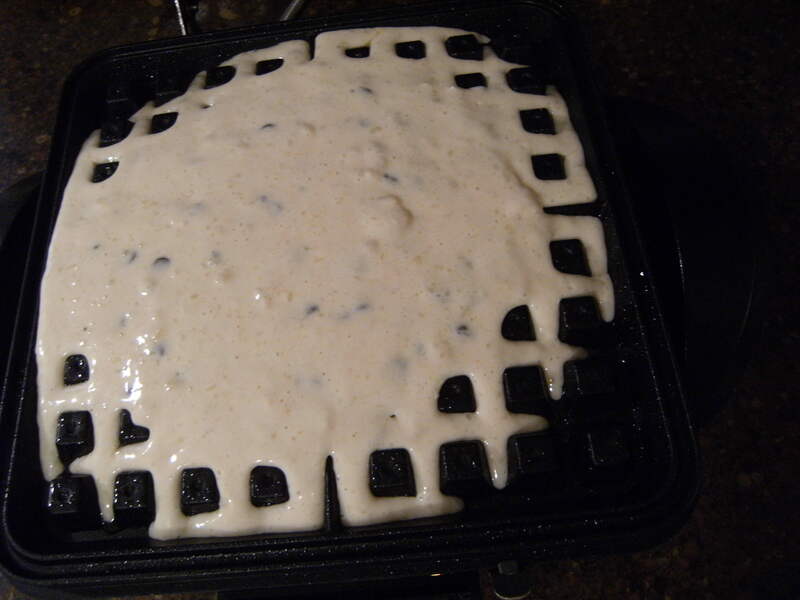 Pour some batter onto the hot and lightly greased waffle iron. 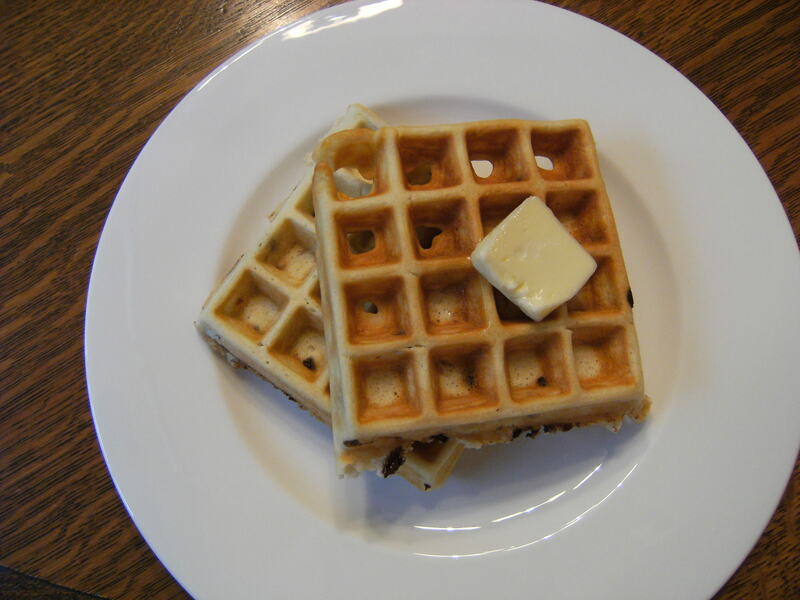 For my 8”x 8” Belgian waffle iron; I use about 2 cups of batter to fill the plates. Standard 6” waffle irons should take about ½ cup of batter. Close the lid, and let the magic happen. 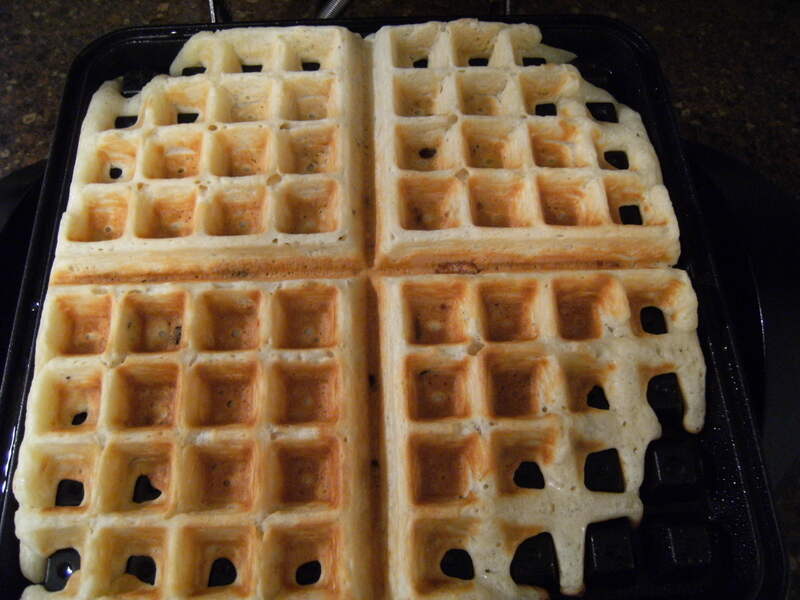 Steam will seem to billow out of the the sides of the waffle iron. This is a good thing. You want the waffles to cook a few minutes beyond when the steaming stops. All waffle irons cook a bit differently, so you really need to watch them until you get a feel for the length of time needed to fully cook waffles on yours. I have a large Belgian waffler, so it takes about 10-12 minutes. Standard 6″ waffles should take about 5 minutes. This recipe makes a lot of waffles. I get about 16 4″ x 4″ Belgian waffles, or about 16 standard 6″ waffles. That means a lot of standing and waiting by your waffle iron. You can easily halve the recipe, or be like me, and freeze the leftovers. Looking to buy a waffle maker? Check out this Good Housekeeping review of Belgian waffle makers. These waffles freeze beautifully. Let them cool completely, then freeze in a single layer in zippered storage bags. When you get a hankerin’ for waffles, pop a couple in the toaster. I usually make a batch of this waffles recipe on the weekend so we have a quick and easy breakfast all week. And the kids can heat up the waffles by themselves, which means that I may actually get in a shower before leaving the house in the morning. Everybody wins! Do you have a favorite waffles recipe? Whisk eggs until well blended and fluffy. Add remaining ingredients, except for the banana and the mini chocolate chips. 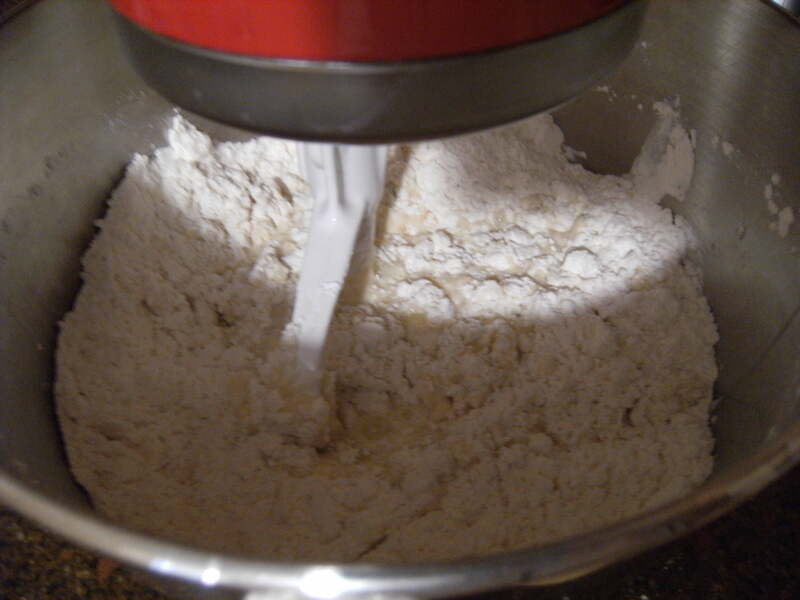 (Sugar, baking powder, salt, flour, milk, vegetable oil and vanilla.) Whisk until well combined, batter will be slightly lumpy. Stir in mashed banana and mini chocolate chips. 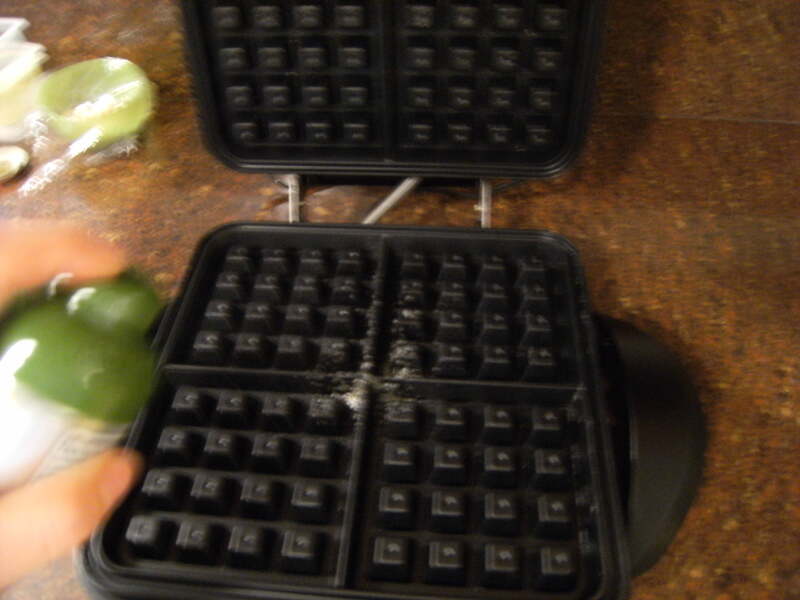 Lightly spray the hot waffle iron with cooking spray. Bake about 5 minutes for 6” waffles, or about 10 minutes for 4” x 4” Belgian, or until steaming stops and waffles are golden brown. This waffles recipe can easily be cut in half to make fewer waffles. If you liked this waffles recipe, you’ll probably love these, too! Previous Post: « Resistance is Futile. Great recipe! One of my favourite waffles. Chocolate and banana is a great combo! Hooray! I'm pleased to hear it, Gorik! I just made these for the family today! EXCELLENT recipe! Loved these!! Hooray! I'm thrilled to hear it, Lori. Thank you for letting me know. Yay, Steve! Any man that makes breakfast for his wife & family is a winner. Thanks so much for the feedback. Glad to hear you all liked the waffles. 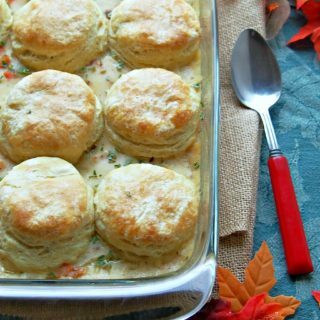 Turkey Biscuit Casserole is perfect for leftover turkey!